If you are reading this, I am dead. 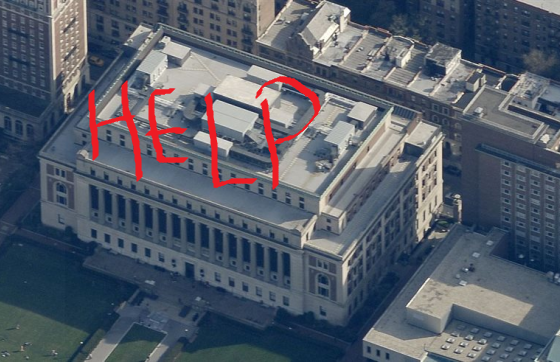 I have been trapped on the roof of Butler Library. I thought that it would be fun to go where I wasn’t allowed, but the moment that I heard the lock click behind me, I knew that all hope was lost. None of the students on the walkway below can hear me scream, conditioned as they are to the terrified cries of premeds in midterm season. The following is a journal of my experiences. Water has been accumulating in empty beer bottles for a long time. There is enough here to last me a while. I’m clearly not the first person up here. I’ve found shelter underneath an air conditioning unit and I’m ready for the long-haul as a roof dweller. I’ve used a granola bar in my backpack to attract some pigeons, and I was able to catch a few in my backpack. Maybe If I catch enough, I can grow my hair out and tie them together like they did with balloons in the movie Up and they will fly me to safety. I’m going to live! My pigeons suffocated in my backpack. I’ve decided to cremate my avian friends. I started a fire with some trash and forgotten vodka. I’m really hungry. It turns out the door wasn’t locked to begin with. Oops. Previous Where is Masturbation Okay?